Clipped wings: A file photo of airplanes at the Mumbai airport. Photo: Ramesh Pathania/Mint. 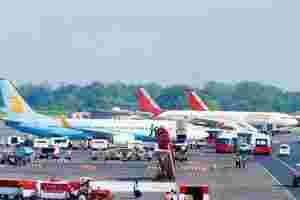 New Delhi: India’s private airlines have asked the government to cut taxes on jet fuel and force state-controlled Air India Ltd to raise fares, as losses mounted at private carriers that control at least 83% of the local passenger market. The airline firms have lost ₹ 3,500 crore in the six months ended September, more than the ₹ 2,900 crore they had lost in the last fiscal, according to an airline lobby group. These private carriers have logged a combined daily loss of ₹ 20 crore in the first six months of the year to 31 March and warned the government that further pressure could lead to closure of one or more airlines. “It is feared that the results for the first six months will show a loss of ₹ 3,500 crore," said Anil Baijal, secretary general of the lobby group Federation of Indian Airlines (FIA), who also attended the meeting. “This way the airlines may not be able to function—one or two may go down," he said. “We feel it will be a serious matter for the economic climate if one or two go down." While the first quarter earnings of the three listed carriers—Jet, Kingfisher and SpiceJet—have been announced, second quarter results are awaited. All three carriers posted losses in the first quarter. FIA member airlines had met in the Capital on Friday to formulate a strategy for the crisis, before meeting the minister on Saturday. This was the first formal meeting between the aviation minister and the airlines since the former took over in January from Praful Patel. Jet Airways’ Goyal told in the meeting on Saturday that his airline was losing an average of ₹ 5 crore a day, two officials familiar with the matter said, asking not to be identified. An email sent to Jet Airways spokesperson seeking comments remained unanswered. A ₹ 5 crore daily loss could mean about ₹ 460 crore loss for the airline in the second quarter, assuming that it lost the same amount throughout the past three months. “This quarter is going to be very bad compared with the last year because of supply addition by low-cost airlines, competition, high fuel prices and rupee depreciation," said Rashesh Shah, an analyst at Mumbai-based brokerage firm ICICI Direct. “For this fiscal, all of them will make a loss." Shah expects Jet’s loss in the second quarter at ₹ 199 crore, Kingfisher’s loss at ₹ 310 crore and SpiceJet’s deficit at ₹ 102 crore. This would mean a combined loss of ₹ 611 crore for the three listed airlines in the September quarter. Air India, which is undergoing a government bailout to tide over huge losses accumulated as a result of a $11 billion aircraft purchase deal, was the focus of Saturday’s meeting. The private airlines, said one of the two officials familiar with the matter, sought that Air India be asked to raise its airfares and not sell “below its cost". To revive its shrinking market share, Air India has been selling cheaper tickets in the domestic market since the start of the fiscal. “The government is subsidizing Air India which allows them to provide cheaper fares—and sustain them," the official claimed. “The suggestion was everyone should operate on cost." Air India, however, has the highest cost structure among the current crop of airlines and may need to price the tickets at double its current value to meet costs. A top Air India official rubbished the claim that the industry was making losses because of the state-run carrier’s fares. “The key question to ask Jet is how much of its ₹ 5 crore loss is contributed by domestic operations and how much by international," he said, asking not to be named, “Jet’s 60% of revenue is from international market, much like ours, which is 65%. Our losses are because of 80% international and only 20% domestic. Fares will anyways rise in the festival quarter of October-December because of strong demand." Air India has raised fares by ₹ 100 twice in the past two months because of fuel surcharges. Airlines also sought reduced taxation on jet fuel—a long-pending demand—to be considered in the 2012-13 Budget. They also sought international flying rights for local carriers that have been lying unused, according to Baijal. Jet and Kingfisher need to raise about ₹ 1,500-2,000 crore and ₹ 3,000-4,000 crore respectively, Shah estimated.